If you’ve ever pulled out a favourite jumper or scarf at the beginning of a new season to discover it is peppered with holes you’ll know how irritating and far-reaching the damage caused by moths can be. Whilst it is possible to repair some knitwear yourself, most requires expensive specialist treatment and in this instance, prevention is definitely better than the cure. So what’s causing the damage? The moths that damage your clothes aren’t the butterfly size ones you see flying round the house. You don’t often see clothes moths – they are smaller and hide away. It is in fact the larvae of clothes moths and carpet beetles that cause the damage to our woollens. Both look for places to lay their eggs and the perfect habitat is nestling down in wool, down jackets, cashmere and silk. The larvae emerge after a few weeks and start eating their way through your wardrobe. Clothes that are in use on a regular basis are far less likely to be attacked as larvae shun bright daylight. They prefer clothes that have been packed away especially those with traces of food or sweat left on… So the answer is … keep things clean. It’s a good idea to vacuum the floor of the wardrobe and any shelves or drawers. This will remove moth eggs as well as dust. Wash down the shelves and dry them thoroughly. At the season’s end, make sure you wash or dry-clean clothes that have been worn before you store them away. Clean clothes aren’t so inviting to moths. Moths don’t eat clothing made from synthetic or cotton fabrics so it’s useful to pack favourite items in clean cotton zip-up bags. If you have items in your wardrobe that are clean but you’ve not worn (why are you keeping them?) then there’s no need to pay for dry-cleaning but instead take them outside and brush them vigorously with a stiff clothes brush. 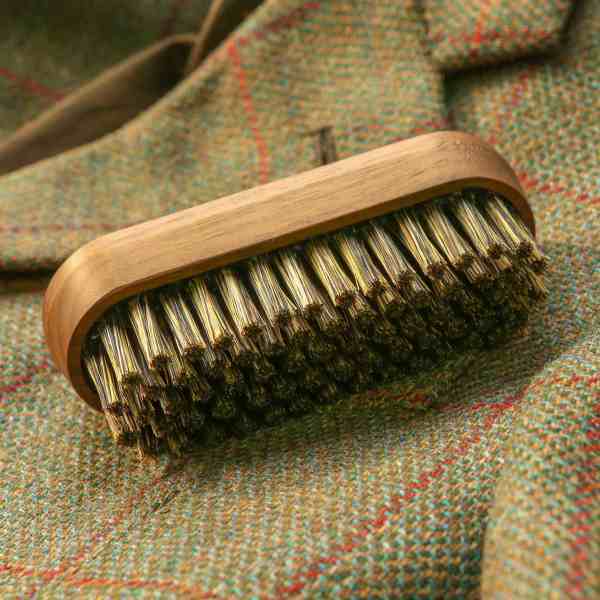 (http://www.plainuseful.com/product/turner-harper-clothes-brush-beech) You need to brush the seams, pockets, collar and cuffs to remove any hidden eggs and larvae. There are lots of products on the market to help you deter moths. Some are natural and some are chemical. I’m less keen on using chemical solutions as there may be unintended consequences of skin allergies and I don’t like the chemical smells of the pesticides. I prefer, instead, to use Red Cedar Wood. The natural oil of the wood kills clothes moths and their larvae. As the scent starts to fade you can resurrect it by lightly sanding the wood. You can get Red Cedar Hook Ups (http://www.plainuseful.com/product/red-cedar-hook-ups-pack-of-2) that hang in the wardrobe and Red Cedar Balls (http://www.plainuseful.com/product/red-cedar-balls) for use on shelves and in drawers. As clothes moths are so small you probably won’t be able to see them but will only see the damage to your clothing. Moth larvae leave silky webbing and beetle larvae shed their dry skins about the size of a grain of rice. Vintage clothing can be a culprit. Though your newly purchased coat may look lovely, does it harbour moth eggs? If it does, then by hanging it in your wardrobe you are introducing the problem to the rest of your clothes. You must ensure it is properly clean before putting it away. Of course, the ultimate solution is to wrap yourself in synthetic fibres and burn all the wool, silk and cashmere but for most of us that’s not an option we want to consider! Have a wardrobe cull – only keep what you wear – someone else can benefit from the rest. Empty your wardrobe, vacuum it and wash the shelves. Wash or dry clean all your clothes before they get packed away at the end of a season. Use zip up bags made from cotton or synthetic fibres to store your favourite woollens. Use Red Cedar Wood Hang-Ups in your wardrobe and Red Cedar Wood Balls or lavender sachets on your shelves and in drawers. Replenish the scent from time to time. Ostrich Feather Dusters – Ruffling a Few Feathers!